The border crossing from Vietnam into Cambodia was an easy one! We splurged for a VIP bus service that was arranged by a tour company in Saigon. The ride from Saigon to the border was comfortable and uneventful, we sat in cushy seats with air conditioning and watched a James Bond film. A few hours later we arrived at the first border crossing, where we would be leaving Vietnam. This was made very simple, since they had collected our passports and our money as we were getting on the bus. We stopped at the border crossing, which was empty, and waited for about 15 minutes while our passports were processed in bulk. After they were stamped our names were called and we walked through passport control one-by-one. 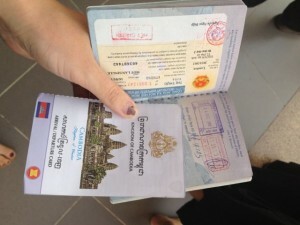 We were given an exit stamp and our arrival/departure card for Cambodia, and we got back onto the bus. Ignore my post-wedding nail polish, I was starting to look pretty ragged at this point. The bus drove for just a few minutes before we were kicked out again at the Cambodian side. Once again we waited for about 15 minutes while our passports and visas were processed in bulk. After that it was an uneventful ride to Phnom Phen, the capital of Cambodia.